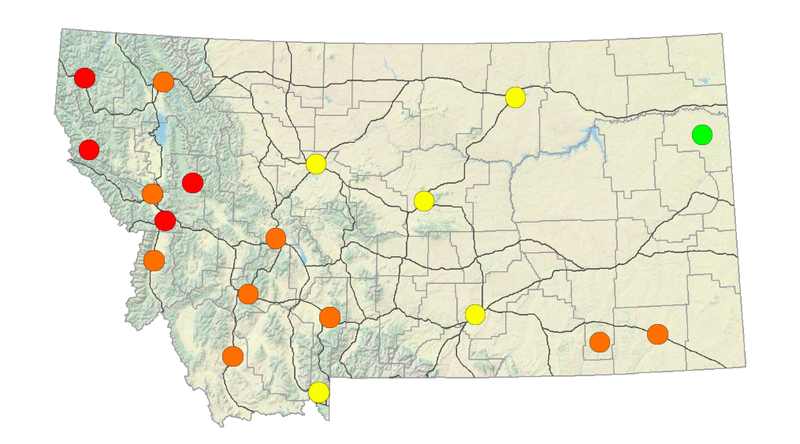 Today's Air is a Montana specific site that provides information on hourly levels of fine particulate matter (also known as PM2.5, the main pollutant of concern in wildfire smoke) across the state. This is your best site for finding accurate updates on PM2.5 and wildfire smoke exposure for Montana communities. Read the most recent Wildfire Smoke Update to learn what the smoke in Montana is expected to do over the next few days and why. For the extended seasonal forecast, click here. The picture above is not updated daily. Click on the map to see current information. Use pre-determined landmarks that were established on a clear day for distances. Determine the limit of your visible range by looking for targets at known distances (miles). If don't live close to any air quality monitors (see the Today's Air map), these visibility guidelines may help you gauge the level of smoke in your area. Click here to see what the different categories (unhealthy, very unhealthy, hazardous, etc.) mean and how they affect us. Click on the image below to use the DNRC Interactive Wildland Fire Map. This map shows the size and locations of wildfires in Montana, but does not display smoke plumes. Scroll down to view Climate Central's Fire and Smoke Plume Map. Know where the fires are all across the U.S, and where smoke plumes are traveling. We love THIS MAP hosted by Climate Central with both fire boundaries and smoke plumes (note: it might take a while to load via the WXShift website). Scroll down for links to additional maps and resources. The AirPact Map shows fine particulate matter patterns for the pacific northwest, including Montana. The site is run out of Washington State University, and is a great visual forecast of where the smoke is going. Air now provides current and forecasted air quality information for Montana and other states across the U.S. Data is collected by the U.S Environmental Protection Agency. Hourly data on this site is not as accurate as the Today's Air site because of data averaging. ​Individuals can use the smoke sense app to learn about wildland fires and smoke health risks in their area, as well as report health symptoms and earn weekly badges. The Smoke Sense app uses the same system as Air Now (it calculates AQI, not particulates specifically, and is based on 24 hour averages). Visit the EPA's Smoke Ready Toolbox site for additional resources. Once you know what the air quality is like in your area, it's important to make decisions that will keep you healthy. Read about the health impacts of wildfire smoke here. Understanding the air outside and your potential health risks is only the first step. You have control over your health impacts. Learn when to exercise and how much, what air purifier to buy, how to ensure you have cleaner air in your home, and what to do if you have to stay outside by clicking through the other pages of this site.